When I first set up the bus (in 2015), my mum asked friends and relatives in France if they had any books they could donate, and I brought back a car load in the May. This book was one of them. My mum kindly backed it with green film ha ha! Click here to watch over on my YouTube channel a short video of me introducing this lovely story. This is the story of 2 apples in an apple tree and how they get to become apple trees themselves. 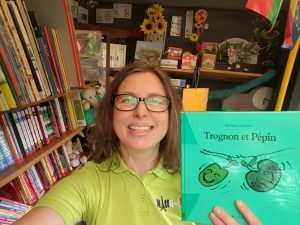 I will ask the children what they think the story is about then teach them what the words "trognon" (chore) and "pépin" (seed) mean, as well as the words "pomme" and "pommier". On the 1st reading, I just want them to listen to the story and look at the illustrations to work out what is happening, then I will check in English with them at the end. On second reading though I will get them to listen out for and keep a tally of 2-4 (depending on age and ability) of the key words in the story. I love this story because it tells you of the cycle of growing, but in an entertaining and original way, through the eyes of the apples. There are some idiomatic phrases which can be picked out and taught to the children: "se fendre la pêche" and "bien fait pour ta pomme". You can enjoy it with younger children without delving into the French too much, just focusing on key words and phrases; however with older children you can also pick a double page and focus on the language and structure more. I want to get the children thinking about what is good and what is not so good for the apples to grow: le soleil, les oiseaux, les vers de terre, le vent. They can illustrate it in the form of a poster showing what makes Trognon & Pépin happy and what makes them unhappy. They can choose the words from a list (and add some form the dictionary) and label their illustrations in French: "ils aiment..." / "ils n'aiment pas...". The story can also be used to get the children to say in French how they think the apples are feeling on each page. If you are looking for free resources to use with this story, check out Master albun here. Other great resources can be found here and here on some of my favourite blogs. You can buy the story here on Amazon.co.uk. Click here for more stories about the growing cycle. Click here if you are looking for other books by Bénédicte Guettier. Do you know of a fun story about apples? Please share it in the comments below!